The journey of the Indian Economic Association began in 1917 through a conclave of teachers of economics held in Calcutta, convened by Prof. C.J. Hamilton. The period was just aftermath of First World War, and the British Raj of undivided India just recovered from the severe nationalist movement that ensued the Partition of Bengal Province in 1905 by Lord Curzon. The prevailing orthodoxy of discourses on economics in leading centers of learning across the world was the Classical Political Economy, with neoclassical resurgence of Alfred Marshall and Arthur Pigou making visible impacts on economic theory and policy discussions. The world economy was in turmoil, and so was the condition of the Indian economy and society. The British government was not particularly interested in the economic development its colonies; the improvements in the living conditions of the people were not in the main agenda of the government. Communication was weak across the globe, and definitely within the Indian subcontinent, and therefore networking was difficult between regions as well as between persons. Prior to the First World War, professionalism in Economics had no discernible roots in India. Economics as a distinct subject of study was first introduced in Calcutta University and subsequently in other universities, whereupon a small batch devoted economists took the initiative of informing the students about the poor economic conditions and about the policies of the government, which were later listed as text books on Indian economy. In the early 20th century, Government of India instituted University Chair Professorship in major universities of India. In 1909, Professor C.J.Hamilton was appointed as the Minto Professor of Political Economy in the University of Calcutta, and in 1914,Herbert Stanley Javons was appointed as University Professor at Allahabad University. As Professors, they were mandated to organize and carry out research, to train the students and to give lectures which would be published by the Universities. In April 1916, Bengal Economic Association was founded by Hamilton to encourage thorough surveys of concrete socio-economic conditions in India and to organize concerted views on various economic policy initiatives and their implementation through the publication of Bengal Economic Journal with the official patronage from Lord Carmichael, Governor of Bengal, and with help from Sir Jehangir C.Coyajee, Professor of Economics at Presidency College ,Calcutta. I n January 1916, Prof Herbert Stanley Javons established the Indian Journal of Economics as the vehicle of publishing the researches of the Department of Economics of Allahabad University with the aim of disseminating information on economic activities in India to other countries as well. In December 1917, Professor C.J.Hamilton convened a conclave of academic economists from all over India in Calcutta , and the said meeting conceived of the formation of a national body of economists to stimulate interest in and to promote the advancement of economic science in India. Thus the Indian Economic Association (IEA ) was born. Thereafter since 1918, regular annual conferences were held by IEA , almost without major breaks .In the early years, when around 100 to 150 to its members used to attend the conferences, apart from the Presidential address , valedictory address and few invited lectures, the technical sessions and a current topic session were organized where people used to present their papers and discuss . Later, as the size of the Association grew, more technical sessions were added and participation of members increased and swelled. After India attained political independence, the activities of IEA also expanded, and with cooperation from the International Economic Association, some new initiatives like organization of Refresher Courses, International Round Tables and preparation of teaching monographs were undertaken. Now, with the growth and spread of Regional Economic Associations in different parts of the country, seminars and conferences on select themes are being organized by the IEA throughout the years in collaboration with the local Associations, universities and colleges. The journey is continuing with strive for excellence in difference spheres of economics discourse in the country. Dr. C. Rangarajan, the former Chairman of Economic Advisory Council to the Prime Minister of India, while inaugurating the 2010 IEA Conference at Chandigarh , appreciated the role of the IEA in promoting economic studies and research in our country. By focusing on select themes at every conference that the IEA has helped to promote research and study in these areas and the invited lectures have contributed to the expansion of the domain knowledge, he felt. The Association is proud of having as its President, the Nobel Laurate Prof. Amartya Sen in 1989 who was also the President of the International Economic Association. Among its Former Presidents, it was renowned Scholars like R.K.Mukheerjee, C.N. Vakil, D.R.Gadgil, J.P. Niyogi, V.K.R.V.Rao, B.R. Shenoy, A.K. Dasgupta, B.K. Madan, S.K. Basu, D.T. Lkdawala, I.G. Patel, S.N. Sen, M.N. Dantwala, K.N. Raj, V.M. Dandekar, M.S. Adhiseshiah, Bhabatosh Datta, P.R. 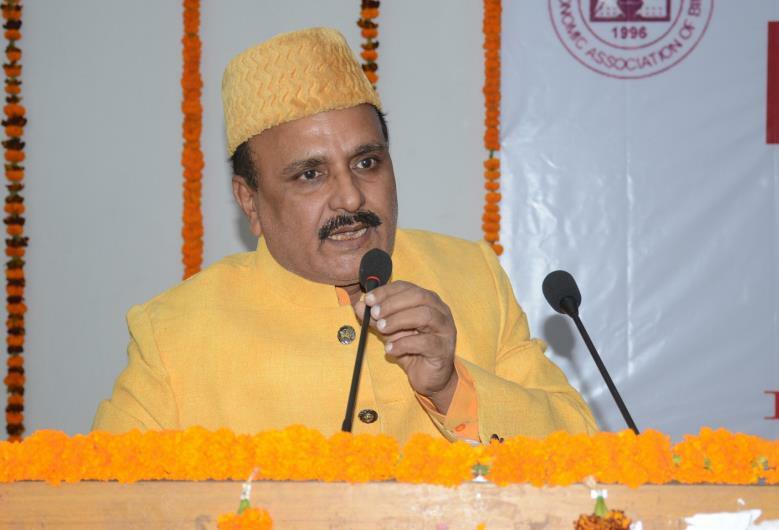 Brahmananda, Gautam Mathur, D.M. Nanjundappa, Kampta Prasad, Manmohan Singh, S.Chakrobothy, Alak Ghosh, C. Rangarajan, A.M. Khusro, V.P. Panchamukhi, Raja J Chelliah, G.S. Bhalla, C.T. Kurien, T.S. Papola, B.B. Bhattacharya, G.K. Chadha, Professor C.H. Hanumantha Rao and many others. One can get a glimpse of the early mission of the formation of the Association as under : "The objects of the Indian Economic Association are academic, and include (a) the holding of Annual Conferences ; (b) the publication of the proceedings of the Annual Conferences ; (c) the publication of a Journal and its free issue to members ; (d) such other action to promote economic science and the dissemina-tion of economic information as may be deemed advis-able. "(Preamble/Prospectus of Indian Economic Association, IJE, December 1918) . The membership of the Association was open to teachers and students of Economics and also to other persons interested in Economics in general or in particular , in economic problems. It was further laid down: "The annual subscription is Rs 12 payable in advance. The official year is from 1st June to 31st May. The subscription entitled members to attend the annual conferences, to receive a copy of the Association's Journal — the Indian Journal of Economics, Allahabad — and any other publications of the Association unless expressly accepted. The Management was vested in an Executive Committee elected at the annual conference." Notably, the stated objectives of the Association have been broadened over the years , by incorporating newer aspects into its ambit and framing the detailed Constitution of the Association in tune with the emerging needs and tendencies. Understandably, such an expansion of the domain of the activities pursued by the Association at present as compared to its initial past, connotes not only the framework of its operation, but also the various regulations that are in place to tackle emerging problems. It is appropriate to quote at length the following comments from Dr.V.R.Panchamukhi , a former President of the Association, and also a former Managing Editor of the Indian Economic Journal regarding the achievements of the Association : "The Association has many achievements to its credit. It has been organizing regularly Annual Conferences in different parts of the country at which a large number of economists from different spheres of the Indian society assemble and exchange views on many current economic problems.It has organized many Workshops, Refresher Courses, International Round Tables and Regional Conferences; all of them have made significant contribution to the progress of economic science and the economics profession in the country. The Association has also been publishing regularly the Indian Economic Journal which has earned the highest reputation in the world of economic journals at large. The Journal has published articles of high standard not only from India authors, but also from renowned celebrities of the economics profession from the other parts of the world. The contributions of the Journal have been unique in facilitating the improvement of the analytical standards of the teachers and the researchers in the country. "( Panchamukhi ,1994). Further, it may be noted that the IEA had organized the 8th World Congress of the International Economic Association in New Delhi, and is regularly involved in academic endeavours with this international body. Besides, many members of the Association are honored by various professional bodies in India and abroad for their seminal academic contributions in diverse domains of economic science.